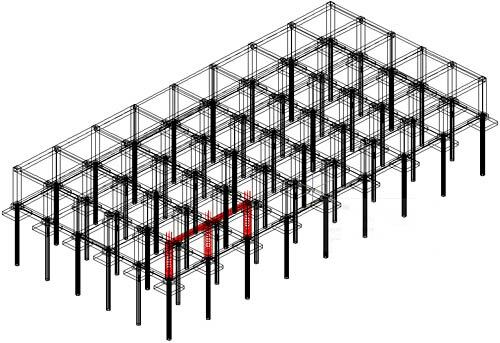 A360 online viewer allows you to combine and connect data to better create, view, analyze, share, and manage information on your structural projects By exporting a completed Advance Steel model to ACIS we can upload the project to A360. Check out my screencast video showing whats possible with the new features in A360. With every model uploaded you will now have a 2D view and also use the section tools to cut the model in any required axis. Founded in 1956, LEGRAND is involved in the field of railway engineering, metalwork and signage industries throughout France for over 50 years. In 1981, LEGRAND chose to diversify its client base and its business activities by creating a Steel Construction Department in the Quincieux site (Dpt 69). This department includes its own design office which is equipped with a modern and recently renewed IT infrastructure. Currently, LEGRAND employs about 200 people. Jean-Sébastien COURIVAUD, Design Office manager and Jean-Charles MASBOEUF, Draftsman, report their satisfaction of the Advance Steel software. How did your drawing software equipment evolve within your Design Office? J-S COURIVAUD: Ten years ago, we switched from the drawing board to the use of AutoCAD® in 2D, and then we realized the projects were becoming more and more complex. So we have equipped the Design Office with 3D CAD software dedicated to the steel construction industry in which 30 people are working at the Quincieux site. We initially started with Prosteel before choosing Advance Steel. After a personalized demonstration, it was clear that Advance Steel would provide us with significant productivity savings through the automatic detailing and the quality of the final drawings. Today, we have 4 Advance Steel licenses to deal with our footbridge and highway bridge projects. What are the advantages of Advance Steel compared to the software you were previously using? J-S COURIVAUD: The main saving concerns the drawing time creation which is extremely fast with Advance Steel. In addition, a permanent link exists between the 3D model and all the generated documents using the integrated AS document manager, which facilitates the overall project management. J-C MASBOEUF: Our footbridges typically include curved elements such as lower arches supporting the steel structure and the bridge deck. Advance Steel knows how to manage these kinds of elements without affecting the global performances of the software. How have you customized Advance Steel to match your work methods? J-S COURIVAUD: Customized drawing styles have been created to produce drawings perfectly corresponding to our presentation criteria (dimension styles, line thickness, dimensions, etc.) and they can be directly launched from a dedicated toolbar that we have also created on our own. 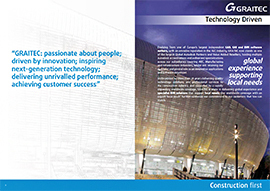 J-C MASBOEUF: We extended the Advance Steel catalogs with steel profiles used for our bridges. We also added new anchors that secure the structure on concrete abutments. With the help of the GRAITEC technical support, we configured Advance Steel to work with our fabrication machines at the workshop so that the unfolding of folded plates can be obtained by the criteria of the machines (value of the plate elongation, folding radius, plate thickness, etc.). Can you give us a description of the footbridge project you recently built with Advance Steel? J-C COURIVAUD: The construction is a pedestrians/cycles footbridge (access to Anonnay between Peaugres and Davézieux on the RD820). This steel footbridge with 40.30m straight span consists of a mixed steel/wood frame and a concrete floor on HEA 200 beams spaced every 3.40m. The supporting structure is made up of 2 tapered glue-laminated arches 48cm apart and braced with steel parts. The latter are associated to the level of the deck with 2 lateral steel beams of constant height and connected vertically by two transverse V shaped steel stays (welded plates steel profile stays). The total weight of the structure is 32 tons. How did you collaborate with the other companies working on this project? J-C MASBOEUF: We exported the entire Advance Steel 3D model to the ACIS format and we sent the electronic file to MATHIS, the company in charge of the wooden railing of the bridge. For their part, they completed the 3D model by precisely positioning the overall handrail and other wood laths between the steel posts in inverted V, which required specific and precise cuts at the ends of the wooden elements. Then, this completed model was sent back to us and I could import all the wooden parts in my Advance Steel model to automatically produce overall drawings representing the steel structure, the concrete bridge abutment and all the wooden elements. To conclude, what is your general impression of Advance Steel? J-S COURIVAUD: Advance Steel allowed us to definitively move on to 3D design which gave us new opportunities and solutions to architects complex requirements. Also, the produced documents perfectly match the needs of the workshop and our clients. J-C MASBOEUF: Once adapted to our needs, Advance Steel has proved to be very easy to use simultaneously allowing us to deal with projects even more and more complex and atypical. 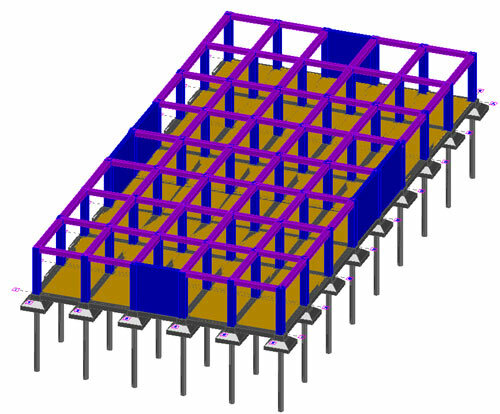 Advance Concrete provides the option to get a single “dwf” file which contains reinforcement elements and the structural model. This file is necessary for importing the structural model into other software like “Autodesk Navisworks“. For this example, consider that some structural reinforcements were reinforced using some dynamic solutions. The first step is to create a file that contains reinforcement bars as ACIS 3D solids. First, select all the existing entities. These elements can be selected using the “Select by type” option, found on Advance Concrete‘s Pilot. The entities can also be selected by using AutoCAD®’s “Quick select” tool, or by using Ctrl+A. After all the elements are selected use the “Start 3D viewer” function on the “Advance reinforcement 3D viewer” toolbar. If the model is not completely reinforced (some structural elements are missing reinforcement), Advance Concrete displays a warning message. Using the 3D viewer dialog window, select the third option “Export to DWG file with 3D solids“. If the newly created file is opened in pure AutoCAD®, we will see that the structural elements are made only from simple AutoCAD® lines, while only the reinforcement bars are 3D solids. The second step is to convert the structural elements into 3D solids and copy them over the elements from the drawing created using the “3D Viewer” function. To convert all the structural elements into AutoCAD® solids, select the entities and use the “Convert a structural element into ACIS solid entity” function, on the “Advance Model” toolbar. This function also provides the option to keep or erase the original structural elements. After using this option, copy all the ACIS solids by picking a base point. With the help of the base point the AutoCAD® solids will perfectly overlap the reinforcement entities that were obtained in step 1. Paste the elements in the step 1 drawing by choosing the same base point. Using the “Quick select” tool select all the AutoCAD® simple lines and delete them. In the end, a drawing is obtained which contains only AutoCAD® 3D solids. This drawing can be exported as a “dwf” file, and imported in other software like “Autodesk Navisworks“.